The F5 vertical machining center provides stiffness and rigidity for chatter-free cutting, agility for high-speed hardmilling, accuracies for tight-tolerance blends and matches typical of complex, 3-D contoured geometry associated with modern die/mold applications. By incorporating several enhanced design features, the F5 is able to reduce variability for hours of continuous, tight-tolerance machining. The F5 features X-, Y- and Z-axis travels of 35.4 inches, 19.7 inches and 17.7 inches, respectively, a 39.4-inch-by-19.7-inch table and a maximum work-piece size of 39.4 inches long by 19.7 inches wide by 17.7 inches tall. The machine’s table can hold up to 1,432 pounds, and a 30-tool magazine affords capacity for a wide array of tooling. Included in the standard configuration of the F5 machine is a highly productive 20,000-rpm HSK-63A spindle that incorporates Makino’s patented core cooling, under-race lubrication and jacket-spindle temperature control system. The two-range spindle supplies unique, wide-range capability with the stiffness and rigidity at lower ranges for roughing operations as well as vibration, chatter-free production of small details and fine features using small tools at high rpm. The F5 uses the Makino Professional 5 Control, which affords the perfect blend of a Windows CE graphical user interface (GUI), touch-screen selection offering instant access to information literally at the operator’s fingertips, user-friendly, efficient PC-like capability for data management and editing, and the networking and storage capability of a data center. 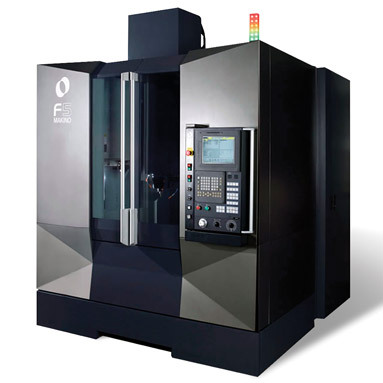 Also featured in the F5 is Makino’s proprietary, next-generation Super Geometric Intelligence (SGI.4) software developed specifically for high-feedrate, tight-tolerance machining of complex, 3-D contoured shapes involving continuous tiny blocks of NC data ensures production rates faster than standard CNC systems while maintaining high accuracy. SGI.4 helps deliver the lowest cycle times and costs achievable by reducing machining times on dies, complex cavities and cores and medical parts by as much as 40 percent when compared to most other control technologies.